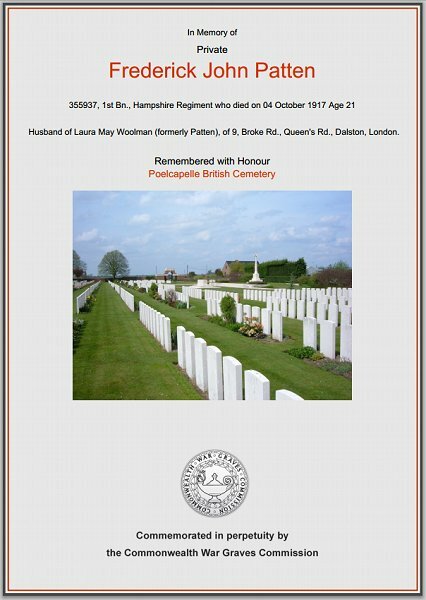 Frederick John Patten was born on 18 January 1898 in Hendford, Yeovil, the son of railway platelayer Maurice John Patten (1869-1948), known as John and originally from Long Load, and Sarah née Oram (1869-1933). The 1901 census listed the family at 29 Brunswick Street; John, Sarah and their three boys William (b 1896), Frederick (b 1898) and 6-month old Reginald. By the time of the 1911 census the family had moved to 4 Hendford Yard; Frederick was a thirteen-year old schoolboy while his father worked as a hay-trusser. When he left school Frederick worked at Aplin & Barrett's factory in Newton Road as a Clerk. Frederick enlisted at Southampton in February 1915, having just turned 17, giving his address as Arnford (presumably meant to be Hendford), Somerset. He joined the 1st (Regular) Battalion of the Hampshire Regiment. His Service Number was 355937. On 20 July 1917, at the age of 19, Frederick married Laura May Cotton in the parish church at Selsey, Sussex. He, at the time was living on an army camp at Bognor Regis, while she lived at East Street, Selsey. The 1st Battalion of the Hampshire Regiment was part of 4th Division and had been in France since August 1914 as part of the British Expeditionary Force (BEF) and had almost immediately entered a series of battles. Frederick, however, did not get sent to the Front until the late summer of 1917. Even so, he would have taken part in two battles with the Battalion; the Battle of Polygon Wood and the Battle of Broodseinde. The Battle of Broodseinde, 4 October 1917, was the last of three successful “bite and hold” battles launched by General Plumer during the middle phase of the Third Battle of Ypres. Both sides were planning an attack on 4 October. When the British bombardment began, it caught a number of German units out in the open preparing for their own attack. The British attack contained divisions from Britain, New Zealand and Australia. As at Polygon Wood, the British attack achieved its main objectives and then halted to dig in. Although these attacks are normally described as small scale battles, the casualty figures demonstrate the real scale of the fighting. The Germans suffered 10,000 casualties and lost 5,000 prisoners. On the Allied side the Australians suffered 6,432 casualties, the New Zealanders 892 and the British 300 - including newlywed Frederick Patten. He was aged just 19 and had been married less than eleven weeks. 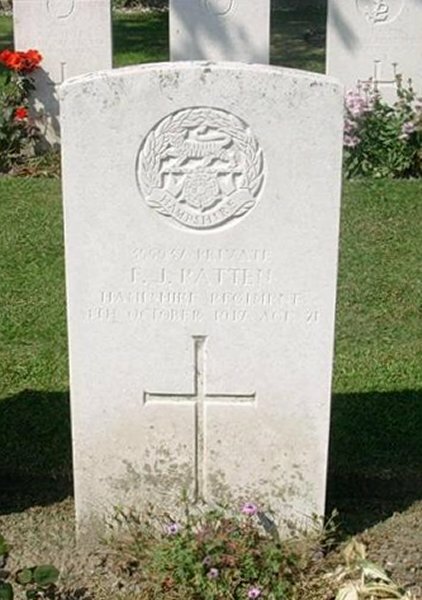 On 9 November 1917 the Western Gazette reported "Mr and Mrs Patten, of Hendford, have received information that their son, Private F Patten, of the Hampshire Regiment, was killed in action on October 4th. Private Patten enlisted in February 1915, and had only been at the Front a few weeks. Prior to joining up he was employed as a clerk at Messrs. Aplin & Barrett’s. He was 19 years of age and had only been married three months. Much sympathy has been expressed with the parents in their sad bereavement." Frederick was interred in Poelcapelle British Cemetery, Langemark-Poelkapelle, West-Vlaanderen, Belgium - Grave XIV.E.8 and his name is inscribed on the Borough War Memorial. 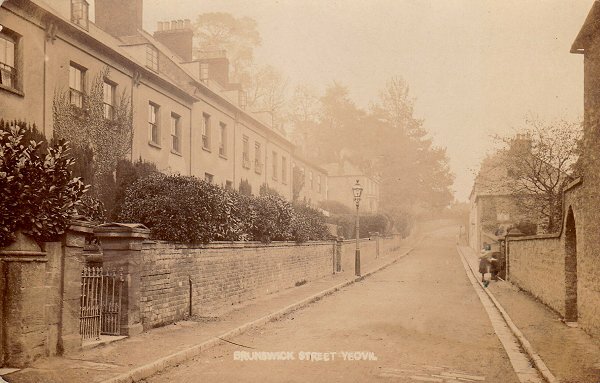 A postcard dated 1906 looking along Brunswick Street at the time the Patten family lived there. Their house was one of the last houses in the terrace at left. The Commonwealth War Graves Commission certificate in memory of Frederick Patten.